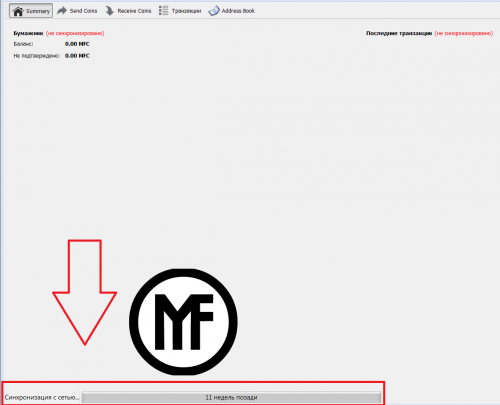 Download file MFCoin-qt.exe here. before download it is recommended to stop your antivirus program for a while. Normaly antivirus progrum identify MFCoin-qt.exe as infacted with trojan virus but it is fals positiv so every thing is fine there. Now create and confirm password. This password will be asked each time you will send coins to somebody. To prevent any possibpe mistakes with password it is highly recommended to create new txt file enter password there and then copy it to wallet. Please save txt file with password to usb flash drive. When wallet will be encrypted the button "encrypt wallet" will become inactive you also will see a lock in the right bottom corner of wallet window. it is the adress you should inform the sender to receive coins from him. IMPORTANT: if you set up mining process to this adress and yuo can find it on the poow in Workers tab then first coins will come in approximately 5-6 hours. In case of low productiwity of your equipment or total power of network is extremely high it may take a day or more till first income. The minimal amount to be send as mining reward is 0.01 MFC. It is absolutely not necessary to create a new address, but if you need it then press "New address" button in left bottom corner.